Our experience at TAKA Jewellery was one of inconsistency. One store we went to had an underwhelming ambiance with an aggressive salesman and poorly cut diamonds. The other store showed improvements in all three categories. One consistency was the value. We were able to find better value at Blue Nile. To be fair, the premiums TAKA Jewellery charges were reasonable for a physical retailer. As we explain in this article, there is no way they can compete on price with buying a diamond online. A 20-25% markup is definitely reasonable. I just did not feel that the in-store experience, even at the better location, justified paying any premium. TAKA Jewellery was founded and established in Singapore in 2001. From a little shop in Clementi, TAKA Jewellery has outdone itself by expanding into a strong presence of 18 outlets islandwide, and is part of the Singapore Exchange (SGX) Catalist-listed “TLV Holdings Limited.” This outstanding feat was effectively accomplished within a mere 15 years, and is made possible with the continued support of our discerning customers. TAKA Jewellery’s extensive range of jewellery items and designs consist of classic solitaires for everyday wear, to coloured gemstones and designer statement pieces for parties or functions. Most recently, the brand launched its 916/999 Gold collection at competitive prices, once again ascertaining its promise in providing value for money jewellery to customers. Apart from the local retail scene, TAKA Jewellery is also an active participant in the international wholesale market, being one of the biggest exporter of diamond jewellery from Singapore. TAKA Jewellery participates actively in key global exhibitions and fairs such as the Hong Kong Jewellery & Gem Fair, MidEast Jewellery Fair (Sharjah, UAE) and Baselworld Watch and Jewellery Show. Outside the ION TAKA location. TAKA Jewellery operates in the way many US jewelers work. Instead of offering fulling mounted rings, they help you find the diamond first then match it with the setting of your choice. This is how it works when you buy online. While secret shopping in Hong Kong, Australia and Singapore we’ve found that jewellers that operate like that tend to take at least one week to assemble the ring. TAKA manages to do it within 24-36 hours. We visited two locations for TAKA Jewellery in Singapore. The first one was on Orchard Road. The store itself was underwhelming. They are pretty simple and give off much less of a luxurious vibe compared to the other retailers we visited in Singapore. We found the salesperson to be very pushy and way to slick for our tastes. The store in ION Orchard’s Diamond Promenade had a better feel. The ambiance was on par with the other stores in the promenade. The experience with the salesperson was also a vast improvement. He was affable and helpful. Surprisingly the quality of the diamonds varied depending on which location we were in as well. The first diamond we saw was a 1.00ct F color and SI1 clarity for 8,229 sgd. The diamond was poorly cut which resulted in a dark stone that completely lacked brilliance. The biggest issue was the 64.8% depth of the diamond. The second diamond we saw was a 0.90ct J color, VS2 Clarity cushion cut diamond for 3,089 sgd. Once again this diamond was poorly cut, with a 76% depth. That, coupled with the J color (which we don’t recommend for cushion cuts, as you can read about here), made the diamond look incredibly yellow. The diamond we saw in ION Orchard was a vast improvement. This was a round brilliant 1.20ct I Color, VS1 Clarity diamond for 11,299 sgd. Unlike the others, this diamond was superbly cut. The diamond was bright and brilliant. Let’s start with the first diamond we saw: The 1.00ct F color, SI1 clarity for 8,229 sgd. Here is a comparable 1.00ct F color, SI1 clarity diamond from Blue Nile. Like the diamond from TAKA, this one is poorly cut. This diamond costs 6,658 sgd. That is a savings of 20%. A 0.90ct J color from TAKA in ION Orchard. The second diamond we looked at was a 0.90ct J color, VS2 clarity cushion cut for 3,089 sgd. Again this diamond was cut very deep, causing the diamond to appear very dark and yellow. Here is a 0.90ct J color, VS2 clarity cushion cut from Blue Nile for 2,320 sgd. This diamond is cut far better than the one from TAKA. Not only will that result in a brighter diamond, the diamond will also appear 5% larger (we talk about diamond size here). On top of that, the diamond was 25% cheaper than the one from TAKA. The last diamond we saw was a beautiful 1.20ct I color, VS1 clarity round diamond that we saw in ION Orchard’s Diamond Promenade. Here is an equally stunning 1.20ct round diamond from Blue Nile for 8,598 sgd. That is a savings of 24%. As I’ve explained in this article, physical retailers like Takka simply aren’t able to compete with online jewelry retailers when it comes to value for money. With so many additional expenses, from rent to employee salaries, it simply isn’t possible to offer similar value in a retail store. With this in mind, Takka Jewellery’s pricing is reasonable. 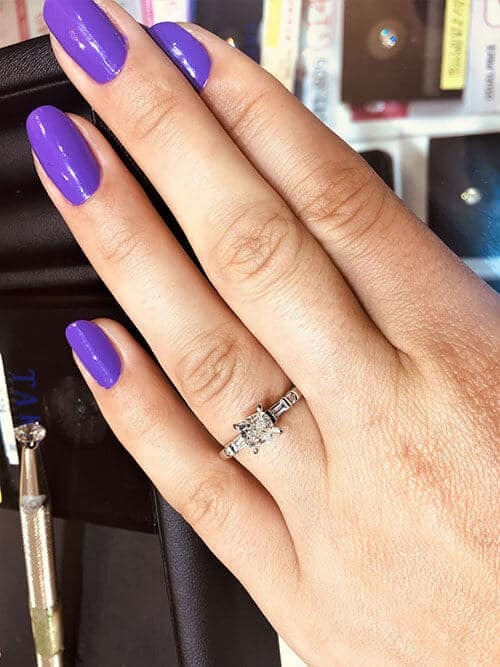 The diamonds we looked at were priced 20 to 25% higher than similar diamonds from James Allen or Blue Nile, which is a fair markup compared to most physical retailers. 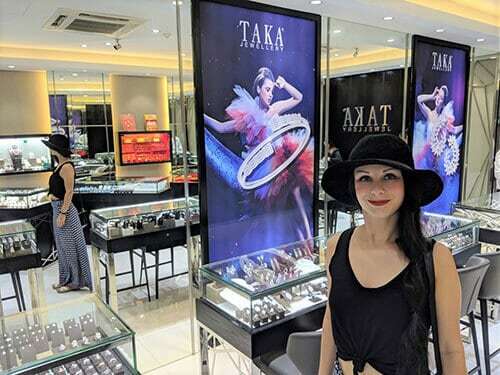 It was good to see that Takka Jewellery delivers finished rings to customers in 24-36 hours, which is significantly faster than the one week or longer we found with most other jewellers throughout Singapore and other places we visited in Asia, such as Hong Kong. From a service and experience standpoint, Takka Jewellery gets a mixed score. The store in ION Orchard’s Diamond Promenade had a luxurious atmosphere and helpful staff, while the store on Orchard Road was less impressive, both in feel and service. 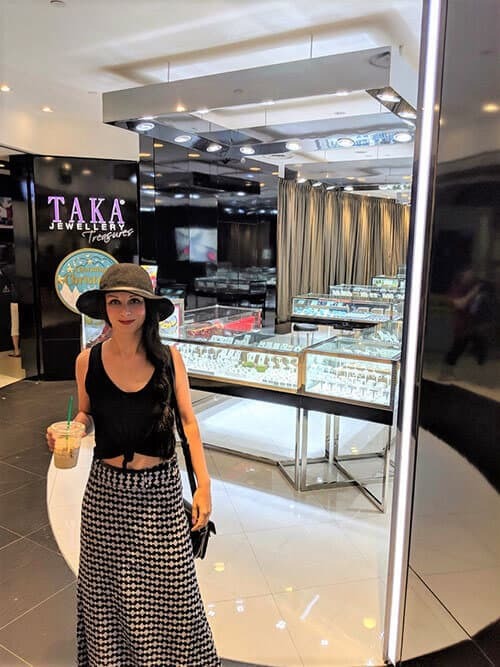 Overall, the diamonds we saw at Takka Jewellery ranged from fairly unimpressive to beautiful, with the diamond we saw in the ION Orchard location the most impressive. The prices weren’t unreasonable but were still 20 to 25% higher than what you’d pay online. It’s hard to recommend buying from Takka Jewellery when a larger selection of diamonds with better pricing are available online from reliable jewelers like James Allen and Blue Nile. Unless you absolutely must see your diamond in person first, buying online is simply a better choice.